The bones of dinosaurs are ancient relics found on Earth. The bones are reconstructed and put back together, where we can visualize them and they become alive. (This is similar to the creation of Adam and Eve from bones.) Recently, researchers in Scotland have discovered a bone of a dinosaur that resembles a snake and this has led them to believe that the snake does not look like a snake we think it is. The scientists say that the snake probably first emerged 128.5 million years ago in the southern hemisphere. This is quite incredible news considering that means a snake was evolved from this other version that had ankles and toes. This version ran around with the dinosaurs. Does this change the vision in your head you had of the stories of the bible? Rather to choose an instance like this to prove religion is wrong, in my mind it is a perfect example of the misconceptions people imagine when reading a religious text. When the bible speaks of that serpent of old, wasn’t it our heads that got to spinning and then we painted art and visualized an inaccurate portrayal-? But that does not take away from the story, it simply adds to it. We have all seen the dragon magic art displaying serpent like symbols and the dragon has always been compared to the snake. The knowledge has always been there we are misinterpreting it and giving in to easily. The origins of the snake are slowly revealing itself to modern day people. This means a huge breakthrough in science and religion. Although science is based on hard facts and evidence they seem to sometimes make wild assumptions and fast conclusions. All the depictions throughout the world of winged beings lead me to believe that we could have also evolved from angels. After all, the bible explains that some angels fell down to Earth. They would inevitably have had children who could have evolved to lose their wings like many prehistoric creatures. What were are ancestors really trying to tell us? Never stop questioning because if we really understood the secrets it still wouldn’t seem so mysterious and powerful… Eternity The symbol of the snake eating itself is a powerful symbol. This is called the Ouroboros. This symbol represents the eternal state of the universe. The snake eats itself, and grows new skin evolving and adapting into the future world. Could this also be a deeper meaning for evolution? Even subconsciously we shape symbols and ideas from our dreams before we ever have the courage to make them into reality. We may not know why we are drawn to a powerful symbol but it still enchants you. Perhaps in your bloodlines, you are remembering your ancient ancestors. Perhaps in your genetics you are creating a future one. 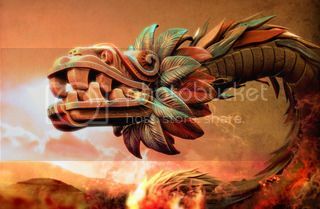 Quetzalcoatl is a Mesoamerican feathered serpent that had divine and mythical properties. Would we recognize these prehistoric creatures as visions of monsters and Gods? I wonder if this was the snake dinosaur that they were drawing. Though the dates seem to be off, maybe the Mayans experienced a time travel of sorts and this is another way to prove it. How would they get an image of this dinosaur serpent without the access to knowledge that we have? Some Maya even mysteriously disappeared. Could there be a time portal somewhere that the aliens gave to the Maya? Could they travel back in time and see the dinosaur? I imagine our sense of worship came from an anxiety and a fear that was deep rooted inside of our ancestors about being ate by other animals. Different ways of survival most likely manifested itself into our heads and the art of worship could be one idea. Maybe if we worshipped the giant creatures we would not get eaten yet than we decided to kill instead for survival. This is because we always act on our deepest impulses, no matter how hard we try not to because we believe in fate and all that. On these people whom worshipped Quetzalcoatl was commonly found an ehecacozcatl, or wind jewel. The amulet is a carved conch shell .Perhaps this was meant to summon the feathered beast? Well in my opinion, these dinosaurs they are always discovering and piecing together like puzzle pieces are starting to look like ancient gods and monsters. I am only wondering where the timing fits in. Their seems to be millions of years of differences in between. Could there perhaps be a sort of time travel accident that occurred in the past and happens to occur regularly? Whatever it is we can figure it out, our genes will never erase the memories and the evidence doesn’t stay buried to long in the earth. For there is nothing hidden that will not be disclosed, and nothing concealed that will not be known or brought out into the open. Luke 8-17 Holy Bible For whatever is hidden is meant to be disclosed, and whatever is concealed is meant to be brought out into the open. Mark 4-22 Dan 2:22 (NIV) He reveals deep and hidden things; he knows what lies in darkness, and light dwells with him.